While something in the beauty of his voice made us, his Filipino fans, go endlessly mad over Fra Lippo Lippi’s now-classic catalogue, frontman Per Sorensen’s melody writing is as equally strong as a foundation for such admiration. In my interview with him held at Hilton Hotel in Resorts World Manila exactly a week ago, he noted two key points about his songwriting routine. One, he gives special treatment to writing song bridges. The other, he is usually wrong in determining which one becomes a big hit. 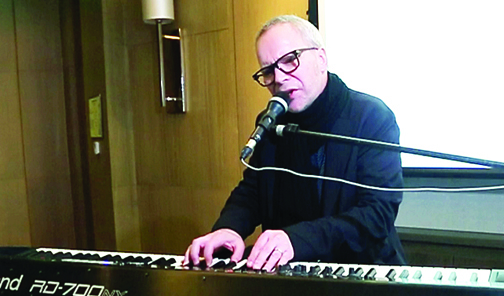 The voice of Fra Lippo Lippi Per Sorensen recently greeted the Filipino media in a way he is embraced for—singing and playing keyboard. “I understand that I’ve done some good work and most of the time I just played through them. I always think this particular song would become a hit and it didn’t,” admitted Per with a wide smile. He co-wrote most of those hits with lyricist and bassist Rune Kristoffersen. Their process put him in the forefront of providing music first before lyrics are laid out. For his somewhat questionable gut feel on what tracks would become popular, he made up for great writing that stood the test of time. Cases in points: “Beauty and Madness,” “Angel,” Light And Shade,” “Shouldn’t Have To Be Like That,” “Everytime I See You,” “The Distance Between Us,” “Later” and “Stitches And Burns,” the duo’s most streamed song to date. For that, it made sense that when he starts singing “Time after time/Nothing that I can do” in “Stitches and Burns,” it puts our listening experience further to a spot unique from the rest of the song and then sensibly, it gets us back to the hook. On an emotional level, it warmly stitches the wounds. Per, who has been writing tunes since he was 13, will perform in a concert in front of Filipino audiences tomorrow night at the Newport Performing Arts Theater (Resorts World Manila in partnership with Ultimate Entertainment). It should be an engaging throwback Thursday experience with the lead singer performing with the Manila Philharmonic Orchestra under the baton of Maestro Rodel Colmenar. The youngest of four brothers, the Norwegian singer-songwriter grew up liking the music of The Beatles, Neil Young, Elton John and few other acts of such magnitude. He recalled being swept over by the sound of Led Zeppelin, especially John Bonham’s ground-shattering drumming. Yet his practice is never to pick a famous song and write one around it. “You don’t do that as you will end up copying and make it a little bit worse,” he said in jest. In acknowledging the foreign crowd loudly appreciating him for the last 30 years, he said he likes our breed for “not holding back” and “just going for it.” He is referring to the Pinoy’s strength to carry a tune. (Tickets are available at the RWM Box Office or TicketWorld outlets).